Visit Akureyri, Iceland’s “second city” and the gateway to its northern coast. 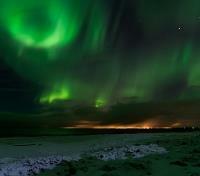 Marvel at the stunning spectacle of the Northern Lights as they dance across the night sky. Soak up the natural splendor of Mývatn, a beautiful inland lake. 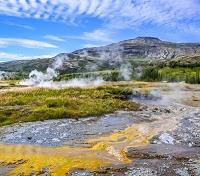 Tour the Golden Circle’s highlights, including the great Geysir and Gullfoss waterfall, and snowmobile across a glacier. Stay at a handpicked selection of quality accommodations. To the Vikings, they were fires in the sky or the gowns of dancing angels. To scientists, they’re the reaction of charged particles colliding with solar winds in Earth’s upper atmosphere. To all who see them, they are simply fascinating. They are the Northern Lights, a rippling cosmic curtain of ethereal greens and reds that ignite the subarctic sky. It starts in Reykjavik, Iceland's quirky capital where, after a restorative post-flight dip in the mineral-rich waters of the Blue Lagoon, you'll get the chance to explore its landmarks and discover its funky atmosphere on a self-guided city tour. Next, explore the wonders of Iceland’s Golden Circle — including both the mighty Geysir and the sublime Gullfoss waterfall — with the help of Super Jeep, then zoom across Langjökull, Iceland's second-largest glacier, on a guided snowmobile tour. From there, head up to Akureyri, Iceland's "second city" and the gateway to the north to get your first glimpse of the Lights on a guided nighttime tour. Next, take a tour of Mývatn, a volcanic lake, and its gorgeous natural surroundings (including the spectacular Goðafoss waterfall, the unusual lava formations of Dimmuborgir, and other sites) before returning to Reykjavik for a stellar send-off dinner from the tasting menu of Grillmarkaðurinn, one of Iceland's top restaurants. Meet your private driver and vehicle for an airport transfer. Along the way, your driver will make a stop at the world-famous Blue Lagoon, where you'll get to enjoy the renowned healing properties as you soothe your soul in its mineral waters. A towel rental is included along with your admission. Afterward, for your added comfort, an English-speaking assistant will help you with your hotel check-in, and take you through your travel documents. Take some time to explore Reykjavik at your leisure. Surrounded by sea, its waterfront paths are perfect for a leisurely stroll or some jogging. Catch beautiful views of Reykjavik's landmark mountain, Mt. Esja, most visible from the northern waterfront. 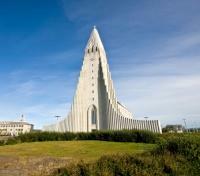 Admire the stark and modern City Hall, standing proudly on the shore of Reykjavik's small central lake, Lake Tjornin. Built in the mid 20th century, the iconic Hallgrimskirkja Church - the largest in all of Iceland - is Reykjavik's main landmark structure, its peak visible from almost everywhere in the city. Out front you can spot an impressively intimidating sculpture of Leif Erikson, donated by the United States in recognition of the discovery of the New World by Norse explorers from Iceland. 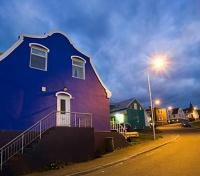 The stark white Hofdi House, built in 1909, might be one of the most beautiful buildings in all of Reykjavik. It is best known as the location for the historic 1986 summit meeting of presidents Ronald Reagan and Mikhail Gorbachev, an event that effectively marked the end of the Cold War. Leaving the light pollution of Reykjavik behind, you’ll set out with a driver-guide and up to 10 other guests on a small group tour this evening to seek out a truly unique experience – the natural phenomenon of the Aurora Borealis, also known as the Northern Lights. Heading out into the cold, dark night in a 4WD Super Jeep that can tackle the rugged Icelandic terrain, you’ll drive wherever the whisper of the Northern Lights takes you, seeking out the best location to see this magical solar display of swirling colors and shapes in the sky. While there's never a guarantee when you’re relying on nature to cooperate, your driver-guide will use their experience to put you in the best possible path to catch this phenomenal display of colors, varying from greenish yellow to beautiful shades of blue, red, pink, purple and white. A sight you'll never forget. 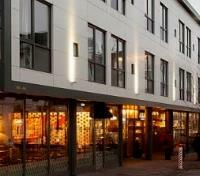 Situated in the heart of downtown Reykjavik, Alda Hotel (4*) is found on Laugavegur, a premier street in the capital’s vibrant shopping district. Steps away from many museums and restaurants, Alda Hotel is perfectly positioned for your stay in Reykjavik, while its well-situated guestrooms featuring Nordic design and modern amenities offer the perfect blend of both comfort and style. Whether you're turning in for the night after a long day of exploring Iceland's magnificent countryside, or resting in between visiting some the city sights literally just steps away from the property, guests at Alda Hotel can be guaranteed one thing – a thoroughly relaxing sleep. Discover Iceland’s renowned Golden Circle route today, departing as a small group in a Super Jeep, for an off-the-beaten-track approach to Iceland’s most famous natural wonders. Along with your guide, and no more than 15 other participants, you’ll head out of Reykjavík, setting course through scenic Thingvellir National Park, site of the Viking parliament, and home to over 1,000 years of human history. Take in the brilliance of the picture-perfect Gullfoss Waterfall, and the great Geyser geothermal area, where the reliable Strokkur geyser spouts hot water as high as 100 feet in the air. End your day with a thrilling snowmobiling experience (2 riders per machine) on Langjökull, the second largest glacier in all of Iceland. Board your direct flight from Reykjavik to Akureyki. Approximate travel time is 45 minutes. This evening, set out on a guided small group excursion, driving out to the countryside or up to the mountains, away from the sounds and electric glow of the city, and into the dark, frozen, wintery night. You’re on a hunt for the magical display of color, light, and texture, known as the Aurora Borealis, or informally, the Northern Lights. The staggering spectacle of light has been likened to a symphony in the sky, shimmering and swelling in color and intensity, often bouncing along in a fluid motion that appears orchestrated. 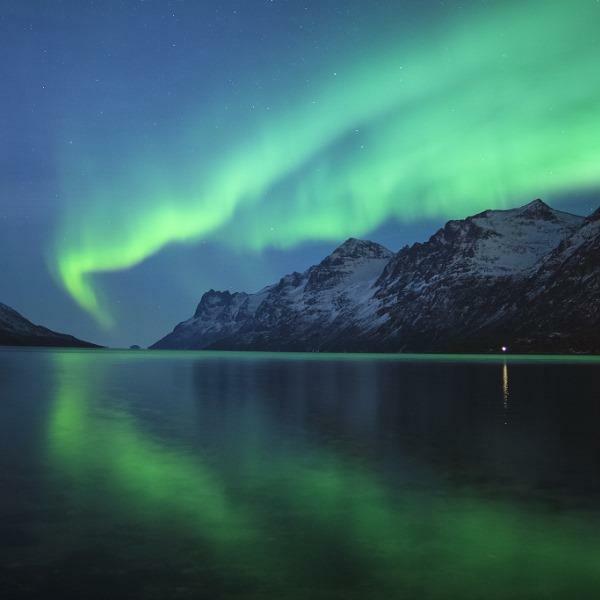 As a natural phenomenon, your ability to view the lights is always going to be weather dependent, though your guide will make every attempt to find the most favorable situation to see this unique show, only visible in the Northern Hemisphere. 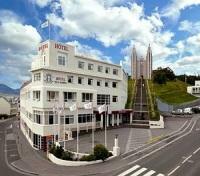 Located in the heart of Akureyri, gateway to the rich natural splendor of northeast Iceland, Hotel Kea (4*) has been welcoming guests since 1944 with the same high standards of elegance, quality, service and comfort which would be expected of one of Iceland’s most established hotels. Comfort, rest and relaxation come easily in all of the 104 guestrooms, equipped with modern amenities to ensure guests have a delightful stay. Múlaberg bistro & bar offers guests delicious meals made with the finest Icelandic ingredients, and one of the greatest selections of wines, spirits, and cocktails in the north of Iceland. 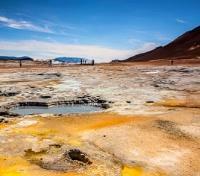 Departing alongside no more than 15 other guests, you’ll embark on a stunning full day guided excursion through the Lake Mývatn region; an area of extreme contrasts, bird life, flora, geothermal activity, geology and saga. Enjoy a visit to the renowned Godafoss waterfall, one of the most stunning in all of Iceland. It’s said that over 1,000 years ago, statues of Norse gods were thrown into Godafoss, as Iceland proclaimed Christianity its new official religion. Discover nature’s epic beauty over the course of your day, as you’ll visit the pseudo-craters of Skútustaðagígar, the Hverir Mud Pools, the Grjótagjá Rift, the Dimmuborgir Lava Fields, and much more. The final stop of the day brings you to the Mývatn Nature Baths, where you'll pause for an hour-long break to enjoy an included relaxing soak in the geothermal pool. A towel will be provided. Board your direct flight from Akureyki to Reykjavik. Approximate travel time is 45 minutes. This evening, make your way to the revered Grillmarkadurinn (The Grillmarket) in downtown Reykjavik, a stylish restaurant honoring a farm-to-table concept to create culinary experiences that delight the five senses. Here you'll enjoy a delightful tasting menu dinner consisting of a curated selection of dishes which highlight the menu, and are served family-style for the whole table to enjoy. Grillmarkadurinn nurtures a close working collaboration with dedicated local farmers to guarantee the very best in local produce for a magical fusion of tradition and modern cuisine. The talented and passionate culinary team highlights the origin of each product by using traditional Icelandic cooking methods of fire logs, coals, open fire and smoke. 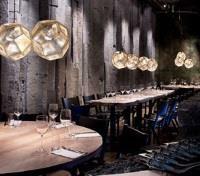 Your included meal is a tasting menu, served in an order best suited to thrill the palate. Please note, drinks are not included and are payable on the spot.